Montague Edward James Butwell Bellamy was born at Thames Street, Oxford in May 1850 and baptised at St Aldate’s Church on 7 July. He was the eldest son of the Oxford bookbinder Montague Bellamy and Zilpah Butwell (see separate grave). At the time of the 1871 census he was aged 20 and living with his family at 57 St John Street, working as a bookbinder for his father, who had six other employees. Elizabeth Castell (born at 13 Broad Street, Oxford in 1851/2, reg. first quarter of 1852). Their father was a tailor, and at the time of the 1851 census Mary (5) and Sarah (1) were living over their father’s shop at 13 Broad Street (right) with their parents and their brothers George (8) and John (3); their father then employed two men and three boys. 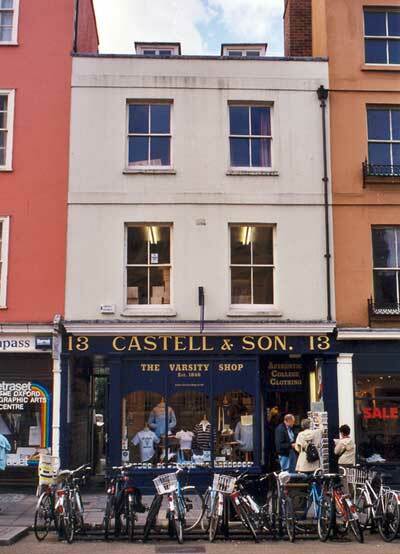 The Castell family still lived over the shop in 1861 but were more prosperous: Mary and Sarah’s father George (48) now employed ten men and two boys, and the family had a servant. Their eldest brother George Loder Castell (19) was now a tailor’s assistant, and they had another sister, Elizabeth (9). In 1871 Mary (25) was still living with her parents over the shop and working as a milliner, and her brother John (24), who was now a tailor like his father, and her sister Elizabeth (19) were also still at home. Her sister Sarah (21), who was also a milliner, was working for a draper on the Isle of Wight and living with his family at 2 & 4 Mill Street, Ventnor. Their brother George Loder Castell (39), who had married Mary Letitia Last in Oxford in 1869, was a tailor living three doors to the west at 10 Broad Street. Sidney Cyril Bellamy (born at Clear View, 16 St Mary’s Road, on 6 June 1889 and baptised at Ss Mary & John Church on 19 September: his birth was proudly announced in Jackson’s Oxford Journal. † Miss Sarah Maria CASTELL died at 13 Broad Street at the age of 27 on 19 May 1877 and was buried in St Sepulchre’s Cemetery on 21 May (burial recorded in the parish register of St Michael’s Church). Mrs Bellamy's father George Castell died at the age of 65 on 15 July 1878 at Acton Villa, Kingston Road, and it appears that the Bellamy family then moved into this house in St Margaret’s parish, and their first two children were born there. 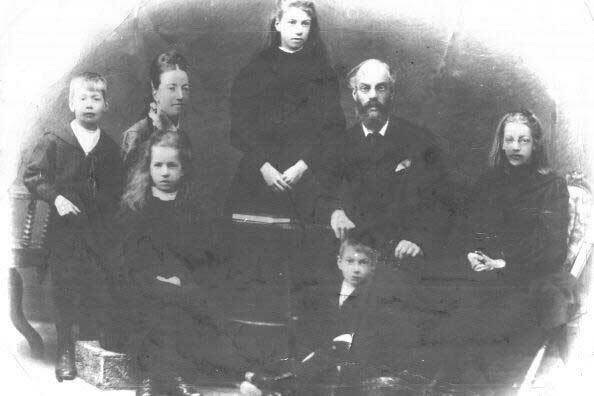 Left: Montague Edward James Butwell Bellamy with his first wife Mary Castell and their five children. The photograph (from the Bellamy family collection) must have been taken shortly before Mary’s death on 2 July 1894. Alice Mary Castell Bellamy is at the back; Ethel Frances Butwell is on the right; and Edith Winifred Bellamy is in front of her mother. Frederick George M. Bellamy is on the right, and Sidney Cyril Bellamy is sitting on the floor in front. At the time of the 1881 census Montague Bellamy (32), a master bookbinder employing one man, was living at 36 Kingston Road with his wife Mary (recorded as 34, but actually 36) and their daughter Alice (seven months). Also living with him was his brother Harry (20), who was now Second Assistant at the Radcliffe Observatory, and one servant. Meanwhile John Castell, the brother of Mrs Bellamy and her sister Mary, succeeded their father as the tailor at 13 Broad Street, and at the time of the 1881 census was living over the shop with his wife. The business was prospering, as he is described as employing 15 men, three “lads” and one woman. In 1884 the family was living at 2 Paradise Square, Oxford, and in 1886 at Cornmarket Street. By 1889 the family had moved to 16 St Mary’s Road in east Oxford. At the time of the 1891 census Montague (41) and Mary (recorded as 44, but actually 46) were living at 16 St Mary's Road in east Oxford with their children Alice (10), Ethel (9), Edith (6), Frederick (4), and Sidney (1), plus one servant. 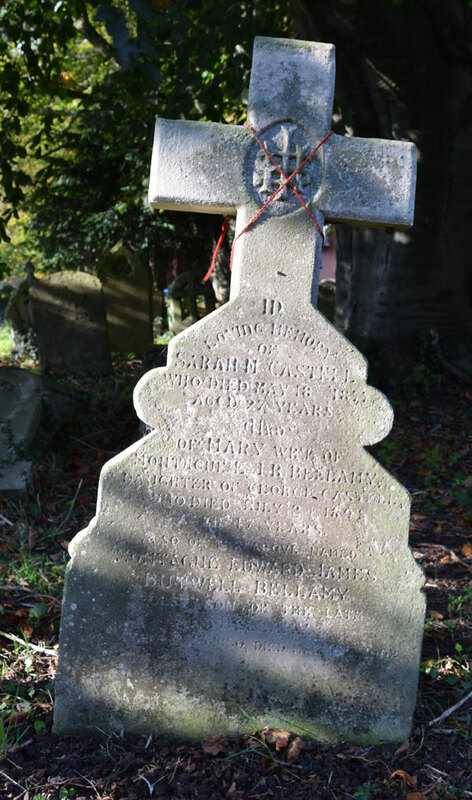 † Mrs Mary Bellamy, née Castell died at 16 St Mary's Road the age of 49 on 2 July 1894 and was buried in St Sepulchre’s Cemetery on 5 July (burial recorded in the parish register of St Michael’s Church). July 2, at 16, St. Mary’s-road, Oxford, Mary, the beloved wife of Montague Bellamy, and eldest daughter of the late Mr. George Castell, 13, Broad-street, Oxford, aged 47 [actually 49]. Arthur J. Bellamy (born in Oxford in 1896/7). Right: Montague Edward James Butwell Bellamy photographed outside his Kingston Road home in about 1901 (from the Bellamy family collection). Next to him in the back row are his children Edith, Frederick, and Ethel. 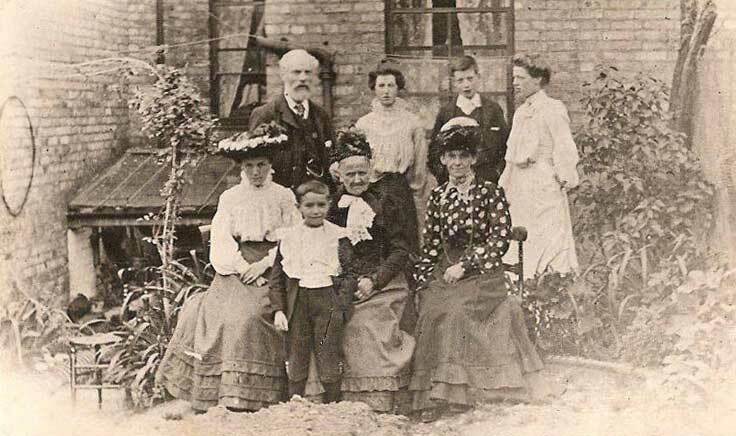 In the front row are his second wife Louisa Jane Cockbill, her son Arthur James Bellamy, an old lady (possibly Louisa’s mother), and Montague’s unmarried sister Ada Maria Bellamy. At the time of the 1901 census Montague Bellamy (51) was still working as a bookbinder and living in 13 Regent Street in east Oxford with Louisa (33) and two children from his first marriage – Edith (16), who was a draper’s apprentice, and Sidney (11) – and Arthur (4), the son of his second marriage. His daughter Ethel Frances Butwell Bellamy (29) was living with his brother Frank, who was an astronomer: she too became an astronomical assistant in the Radcliffe Observatory. † Montague Edward James Butwell Bellamy died at 107 Southfield Road, Oxford at the age of 58 on 16 May 1908 and was buried in St Sepulchre’s Cemetery on 20 May (burial recorded in the parish register of St Michael’s Church). At the time of the 1911 census Montague’s widow Mrs Louisa Jane Bellamy (43) was keeping an apartment house at 10 Parkwood Road, Boscombe, Hampshire, and her own full son, Arthur James Bellamy, a 14-year-old schoolboy, was still with her. On 28 March 1913 the pair set sail from Liverpool to New Brunswick on the Victorian to start a new life in Edmonton with Louisa’s stepson Frederick, who had emigrated there. Her stepson Sidney Cyril Bellamy also went to Canada and died in Alberta on 20 April 1965. 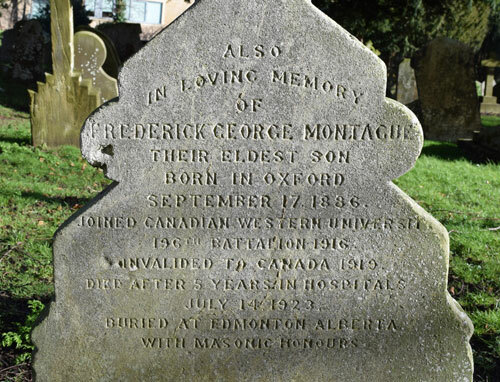 Frederick George Montague Bellamy has the above inscription on the back of his parents’ grave marker, but is not buried there. He emigrated to Canada before the war at the age of 28, arriving at St John, New Brunswick on the Empress of Ireland on 16 March 1912. In 1916 Frederick joined the 196th Battalion (Western Universities) Battalion of the Canadian Expeditionary Force in the First World War. In 1919 he was invalided back to his home in Edmonton, Alberta (11770-95A-Street) and spent five years in hospitals there. He died of his injuries on 14 September 1923 and was buried with masonic honours at Edmonton. His stepmother Mrs Louisa Jane Bellamy died there in the same year. His effects came to £485, and his executor was his sister Miss Ethel Frances Butwell Bellamy, back in Oxford: it was probably Ethel who arranged for the inscription about him to be added to his parents' grave. Frederick’s half-brother Arthur James Bellamy died in Winnipeg on 22 January 1984.